The blog listed in RadCom December 2009! Having fun sending what is probably really bad cw from shack (brr it's cold in here). tx is a FCC-1/FCC-2 dds vfo fed to a hastily built, on the dinning room table, J310/2N3904/2N4401 buffer and a IRF510 PA and LPF. I key the drive to the buffer stage, with the PA voltage being constantly applied, (Look at the TX circuit in the HB-1A, I copied it). I think I get about 4.8W out but not sure my VSWR has gone open circuit and it's too damned cold to fix it. The MFJ-993 tuner says 4.8W but it's never accurate at low power. There is a norcal power meter I built last summer in a box in the shack somewhere but not found it. 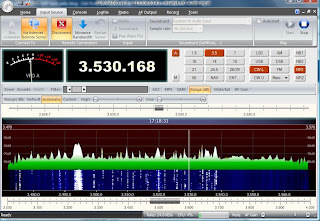 rx is softrock V9.0 using a separate antenna (long wire, non resonant) with Simon Brown HB9DRV new SDR-Radio software. I was going to use the SR V6.2 I have as a tcvr but using that right now for a MOBO build. Keying is using a K1EL keyer chip. Was asked what and how...Salvaging Components using B&Q 1800W heat gun. I have a somewhat huge pile of PCB with both through hole and smd components and it is time to clear some shack space out. I used to salvage with a normal soldering iron and suction pump. This is a faster but needs a bit of care to always produce usable components, especially where they have plastic involved. Through hole is easy, clamp the PCB vertically in a vice, with the component side partially facing downwards. Then with the heat gun running hot for a few seconds before you bring it near the board bring it up to the solder side. It takes seconds only for the solder to heat up enough and the components fall out or you have to 'encourage them' with a pair of long nose pliers. If you work from the top of the board and move to the bottom in time the board will be completely salvaged. The leads can be bent over so this might cause a problem so you may need to pull them out..
For smd the method is a little different, the board is best held in one hand, the solder is heated to point where it is melted slightly, then with the board held over an aluminium foil sheet on a hard board hit one corner hard, either hit the PCB onto the board or hit the pcb above the board. It will be a matter of trial and error but you will soon figure out how hard. Anyway, a nice pile of solder splatters and components will appear. IC are obvious, R will have values on them but C and L will not. I found an easy way to ID the L was to mark the L SMD with a small permanent marker (fine gold spot). Note that SMD discrete components range in size from 0402 to 1206. 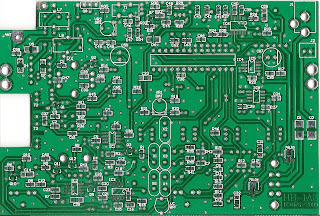 Some PCB seem to be much more susceptable to burning before the solder melts so the ability to salvage components will vary. Only do this in a location with LOTS of ventilation as all sorts of fumes will be created. And exercise extreme care with some components, especially small electrolytic or tantalum capacitors will have a tendancy to 'detonate' if over heated so only apply heat to the solder side. The B&Q heat gun by itself has a 2" nozzle, this works but it also has a couple of attachment nozzles and I started with the 2" reduce to 1" reduction adapter. This may be enough but I also dug through the copper pipe connectors in the garage (we had some plumbing done) and found a 22mm to 15mm reduction adapter and this fits exactly in between the heat gun adapter and the main nozzle. I added some self tapping screws to keep the adapters in place. NB Use a set of safety glasses when doing this along with a set of leather gloves so you don't burn your hands. Proceed without either and frankly you are asking for trouble. Make sure you have a bucket of water or similar close by if the board bursts into flames, one will at least! I measured the jet of air produced from the heat gun after 10 minutes running and it was at almost 600 degrees C. The nozzle will stay very hot for a long time after use, as will the salvaged PCB so keep fingers away unless you want to remove all finger prints from them and don't bring anything flamable close by. I would not use the method on a board you intend to use again afterwards. Been in the shack today, braving the cold, salvaging components from some PCB (B&Q 1800W heat gun) and listening to remote users using the 80m SDR rig. There seemed to be a contest on this w/e as I heard plenty of "cqx2 test". I also swapped the setup SLA as it had dropped below 12V, that was the first time in 4 days operating, so not bad, and most at minus something too! The laptop and subsequent WiFi network connection is kept running with a large 110AH leisure battery with a solar panel recharge that operates during daylight. Yes it really is a 96KHz laptop sound card. 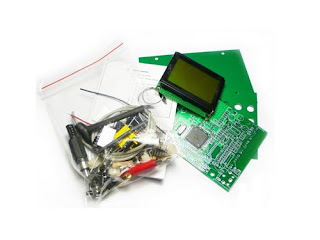 The 80m SoftRock Lite II kit provides a simple to build SDR receiver with a fixed center frequency of approximately 3.522 MHz. When used with a sound card that can sample at 96 kHz, the band coverage is from below 3.50 MHz to about 3.57 Mhz. Note I have really good isolation interface filters between the Softrock and the PC sound card so the signal should be very clean, no central bump. If you scan through the other SDR-IQ and Softrocks on the remote server lst you'll soon see who has not done this. Eventually when you use the console you will be able to set the centre frequency to 3.522MHz but Simon had not included that functionality yet. So what will you get if you log in (this was a capture running my own server remote just now, a high resolution image too open it in another browser window) ignore most of the garbage below 3.5MHz, the big broad signal. The lowest part of the band is actually just below 3.500 on the scale (the calibration is really in terms of KHz either side of a central point). As you can see plenty of 80m cw signals. Obviously 80m during the day in UK is going to be pretty quiet, night time has much more activity. Someone emailed and asked who had logged in and from how many countries... I've not analysed it yet but the country count is growing fast! Simon's software automatically grabs the logged in user, system name and IP address and logs it. This is from the server. The empty entries seem to be caused when the server was restarted. Along with the XMAS post, some QSL envelopes just arrived. 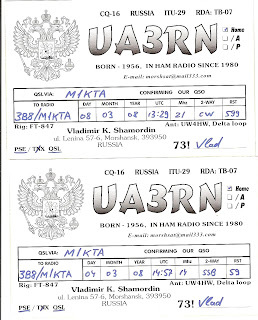 Most were for 3B8/M1KTA and in them was the first set of QSL cards from one op that managed both cw and ssb modes with me. That's a first for me to have the qsl cards that confirm qrp operating both cw and ssb whilst being the DX station. I have a test remote SDR server running now with a Softrock 80m V6 Lite RX that is xtal controlled. The RX signals are all at the bottom end of 80m and the Softrock will 'see' just under 96KHz band width. I believe the signal in the centre is some PACTOR that has been present for hours today but it doesn't seem to decode. The 'server' is a 900MHz Celeron 4G 701 Asus eeePC, so seriously basic and I have both it and the radio running off a couple 12V batteries with a solar panel connected so it's anyone guess how long they'll last. I couldn't come close to running an SDR setup with any of the other SDR offerings with this setup. The antenna is a 6BTV vertical tuned for the 80m cw segment about 3.560MHz so the interG isn't great but the DX can be. Anyway connect to it using Simon's new SDR software. NB I have two sound cards on this beast(!) one is an external USB card, not used right now that is for SR V9.0. I am using the internal Realtek 24bit sound card at 96KHz. So if get no sound and are too eager to try it the reason is probably you need to change to other sound card. Stop the SDR, blue button on right, change the sound card and press start again. Please don't restart the server (button next to disconnect) unless you absolutely need to. Note the total lack of the 'hump' in the centre of the pictures...(click to enlarge) This is because there are no ground loops in my Softrock setups. The software works with RFSpace IQ radios local or remote only right now. Some that have downloaded the software and there are few, have even put their servers up on the internet so you can connect to them. The ability to use a Softrock V9.0 (from Tony Parks KB9YIG) will follow soon. Just as a note for other Softrock owners, Simon's Softrock I built him earlier this year is using V15.10 of PE0FKO firmware. This is a short video of me testing the server software with a very hastily built Softrock fixed frequency V6 80m RX. When I added the server to the list intending to connect to it myself or ask Simon to 3 others connected and played, this was taken whilst one of them connected... you can enable the audio locally whilst the remote user uses the radio. I set the band width FFT quite high so was using c50kB/s. The DX was amazing working VK and ZL's as well as US all QRP. Using my homebrew Norcal-20 and FT817 with Z11 ATU. I bought a car recently and it makes a great mobile shack for all weathers, I was on the beach for maybe 6 hours. It was also the day before rememberance day so I also worked a number of Gb and Northern EU special event stations. The buddi pole was up near the car and I also had a 3el 2m antenna on the first one of 4 (yes 4!) 20m verticals I put up in a square to try and hear AA1TJ. The car was about 15 feet from it at this point so not ideal. This what the beach tooks like when the tide is out. The location is Snettisham South Beach. No camera with me so borrowed those images off the company site. I have written something (will share it with SPRAT too) for QQ (not sure which issue yet) about SDR-Radio from Simon HB9DRV. Keep an eye out for it. Simon and I agreed the title should be something like "SDR-Radio, a vapourware preview... from an alpha tester." By the time the issue of QQ is published I expect first version of SDR-Radio will be released generally. I thought was interesting after George G3RJV put the blog into RadCom to capture who was looking at what and where from. It would be great to have a qso with many of these places. It would be interesting to know who some of you are and if you have any comments. This is a definite plug after these guys helped me out big time. They sell really nice 12V 17Ah and 18Ah batteries, I used two to rebuild a failed UPS battery, and another a little while back for use with a set of solar panels on the shack roof (lighting) but they are also perfect for use as a rig battery, or to float charge off a generator during field day or otherwise. The batteries were £24 each which is pretty cheap. OK Art and Alex pulled the stops out and managed to scrounge together a full kit of parts for me. So I'll be building this asap. However, it is a bit like buses you wait to ages and two come along at once and the same with work so that has taken over in the last week so not apparently done much. I will be building as I did in HB9during 2007 and I will have the mobile /P homebrew bench in a airline carry on bag and build in the hotel room in the evening.... This should be interesting. Just spoke to Simon HB9DRV and his new SDR software http://www.sdr-radio.com is not far away from release including support for USB controlled Si570 Softrocks. The MOBO we will both eargerly be waiting to see the usb sound card add on too the current beta kit is without that. Also one kind soul sent me a pile of 80m crystals after the GQRP valve day and I will add those to the 6V6 TX this w/e and also 'put up something horizontal' so inter G working is possible. As building the V6.3 and MOBO V4.3 and built 4 versions of the V9.0 already and gone through a few different firmware revisions I thought should mention an up to date reference (as of today anyway). The original eons ago firmware, as far as software development life cycles are concerned anyway, that the V9.0 and V6.3 kits used to ship with works, with bugs but it is so old and out of sync with the up to date software developments going on you really do need to update the firmware on the AVR chips. Wander over to http://home.ict.nl/~fredkrom/pe0fko/g8voi/ and peruse the documents on that page. It will explain everything. I am not saying what you have as supplied by W&S or Tony Parks will not work just you should take on-board what G8VOI and PE0FKO say on the matter. This is the story of how I got the PCB. In May 2003 needed a few bits of PCB as I was trying to build a BLT. Maplin wanted what seemed like a huge amount for very little and I had heard mention there were some PCB fabrication places around Cambridge... so I found one... then in total innocence I went in to see them, this was back in 2003 just after I was licenced and asked if they had any 'off cuts' they could sell me. I even had my little bag of change out. The answer was not at that time but could I turn up, a couple days later, which I did on a bicycle with a pannier eagerly hoping might get enough as I was about to build that BLT so didn't need much! Anyway the bod who met me was one of the directors and he listened to what I wanted and why etc... (he wasn't an amateur). So that night he gave me 6 or 7 pieces for what I wanted as long as I showed him the end result which I was happy to do, I went back 2 weeks later with it and a desk pencil holder I had made with the other bits I had left over, I noticed the reception didn't have a place for the pens by the signing in book, so I made one and gave it to them. We bought each other a beer in a pub around the corner and I went off to operate /P for maybe the first time from the bicycle.... he said come back in a month, and he'd have some more bits, I could share with others .... but next time could I come in a car? Anyway I turned up with help from a now SK G0 who had van and he gave me a (48 crisp packet sized) box of off cuts as he explained they go through >1,000 square feet of PCB in a good week, I had been given all the off cuts from the last few weeks production runs. Also he had a stack of sheets c2' x 4' that were not up to spec as the copper was ridged or non uniform, he asked if I wanted them... said yes obviously, he fed a dozen or so into an auto gulloteen (spelling?) and chopped into foot squares. I kept one sheet whole for the home brew bench. He said keep the cash as he would have had to pay to dispose of it all. However, he asked me not to reveal who/where I got it from and if I was to throw it out to contact hime first. A local club when still a member I took the PCB sheets in one night and thought £1 a sheet to club funds seemed reasonable but hardly anyone interested so I took it home and I use/used it for making chassis. The next meeting I took the off cuts of PCB in and said were free needless to say 90% disappeared in minutes, now I realise that the dark stuff was mobile phone/wifi RF stuff. There was all sorts, single sided, double sided, thick and really thin stuff. I did the same thing the following year too. That is how I have it and no don't have deep pockets. This is the same place that also allows me to dispose of used etch solution. Maybe ask your friendly PCB fabrication place? Now If I can just find a mobile phone mast engineering place with some 2" hardline they don't want for that mag loop project! Freq's 3.51140 (3.7W), 3.50746 (4.2W), 3.52800 (5.6W) 3.57903 (7.3W). Missing 3.560 +/- few KHz means few qrp stations find me. The DL 'HOT' contest meant there were a lot of qrp stations on the 80m band. Glass RCA 6V6 valve (1940's vintage valve) TX (as per GQRP rally at Rishworth) with manual change over switch to RX with FT897 (with 20dB attenuation in line when 6V6 TX active). I cannot do that just yet as want to see 1. what KK7B and Kanga US might have to say about it first as the R2/T2 stuff is his, not spoken to him yet! and 2. if I can manage/afford to kit it and after any I get feedback from beta builders but not even at that stage yet! If it doesn't become a kit/project (and I want the PIC code to be worked on by builders too) I will post details. 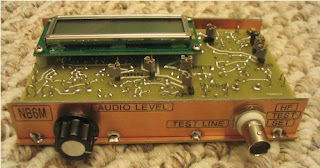 Thanks all for interest and messages though after George G3RJV RadCom Dec 2009 QRP column comment about the blog. As those that follow GQRP list/yahoo group might have noted a few weeks ago I asked if anyone else was building the MOBO SDR setup. ...not for those who don't like SMT. Anyway Tony has just sent me all the Softrock parts required and Art, KY1K and Alex, 9V1AL have agreed to send me a set of PCB and components so I'll be building a MOBO beta V 4.3 shortly. 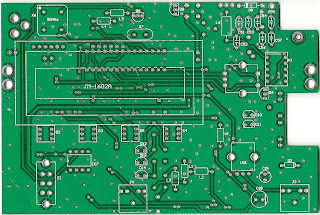 The project will eventually be adding 24 bit 192KHz sound via USB not a sound card and the idea will be to also work with Simon HB9DRV and his new SDR software www.sdr-radio.com to create a frequency agile all band HF transceiver, using only a USB connection so plug and play that can be homebrewed in a modular manner. I dropped Wayne an email and had an exchange about it and one of his older projects (minibootsII that I lent to Michael MI5MTC at GQRP rally). I already checked and I have everything in the junk box/shack shelves so I am going to build an M1KTA version. Probably manhatten style as I realise it's nice to have some ugly in the shack too. to the M1KTA homebrew bench. For no particular reason except I enjoy it I build a fair amount and I find bits of test kit are infinitely valuable, I'll update this blog post as I build it. All proceeds from kit sales are being used to finance OzarkCon QRP Convention so wander over to their site and order one. Just advised of this so found the copy of RadCom December 2009 that I had not even opened yet, along with QST, PW and a few other electronic magazines. It seems G3RJV, Rev George Dobbs wrote about the blog advising readers to come a take a look which was a nice surprise. I'm Hedgehog #8 Dom M1KTA was lucky enough to be asked to give a talk at the first HOGCON, where I spoke about a trip to 3B8 I did in March 2008, the RadCom photo of me looking like I am demonstrating using a hammer to Hans G0UPL, was from that first meeting where Hans also talked, (if you hit a project like this it is bound to work) I think was the quote from HOGCON. If you read the blog and want to ask a question or post a comment please do. The blog contains a lot of different topics and may seem to bounce around, I used to try to update a project blog post directly rather than add new posts so it might not seem like much has changed sometimes. Anyway this post is to state that it looks like I have managed to add SSB to the AD9851 DDS and the RX chain. I have two alternate IF frequencies right now either 4.1952MHz or 11.0592MHz and could go either way. I also decided to drop the idea of making the SSB offset in the DDS and went with the 'standard' BFO setup where you use two crystal oscillators, set off set either side of the IF. Adds to the component count but then that isn't a bad thing. 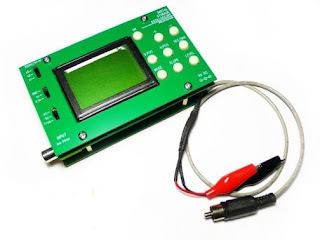 The Softrock V9.0 Switchable BPF, along with the PIC-A-STAR and the QRP2004 designs have made me rethink the front ends and I am thinking that these should be switched. Now I don't mind winding toroids but I am thinking that some small SMT or through hole can type inductors might be workable for a 'no torroid' design. CW as a mode is winning me over and it is probably use that made the difference. My best so far was using a full size vertical loop I put up on 80m for fun back in May and managed 34 at 12 wpm in an hour, it really was me too! I carried on afterwards and managed to put LA, EA, DL, F and IK stations into the log. I found a tin of bits and a page of scribbled notes and the above circuit. Got a spare pair of LM3914 and LED as well so could display both fwd and rev not just the SWR. Using the above as a guide I think I could do this also.... build new or salvage a CB SWR bridge (£3 from Rishworth) - as I need a voltage for FORWARD and one for REVERSE. I believe a stockton bridge would be frequency independent, I think the CB strip line one (stripline circuit) would work but might not work at VHF and might not be very sensitive but either will work. Using Shottky diodes instead of the originals might make it much more sensitive. The circuit has the pins listed but basically you Connect the FORWARD voltage to the REF input on the LM3914. 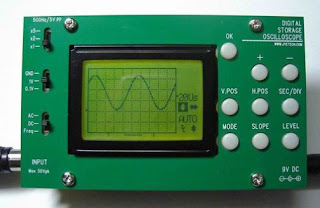 Connect the REFLECTED voltage to the INPUT pin. The data sheets says the REF pin has something like 25K of resistance across it for the comparators, you need a similar resistor across the REFLECTED line so they are seeing the same load so may need to play with various resistors. If I were qrpp then the maximum output from the SWR bridge may be considerably less than the maximum input to the LM3914 so I could use a dual opamp (a LM358 can work with a zero input too can't it?) and amplify both channels - that will give you better sensitivity. I have some LM324 in the tin too. I have a note that says use a small pot to apply the tiniest bit of forward bias to the REF pin to keep prevent a random display of segments when there is no drive.